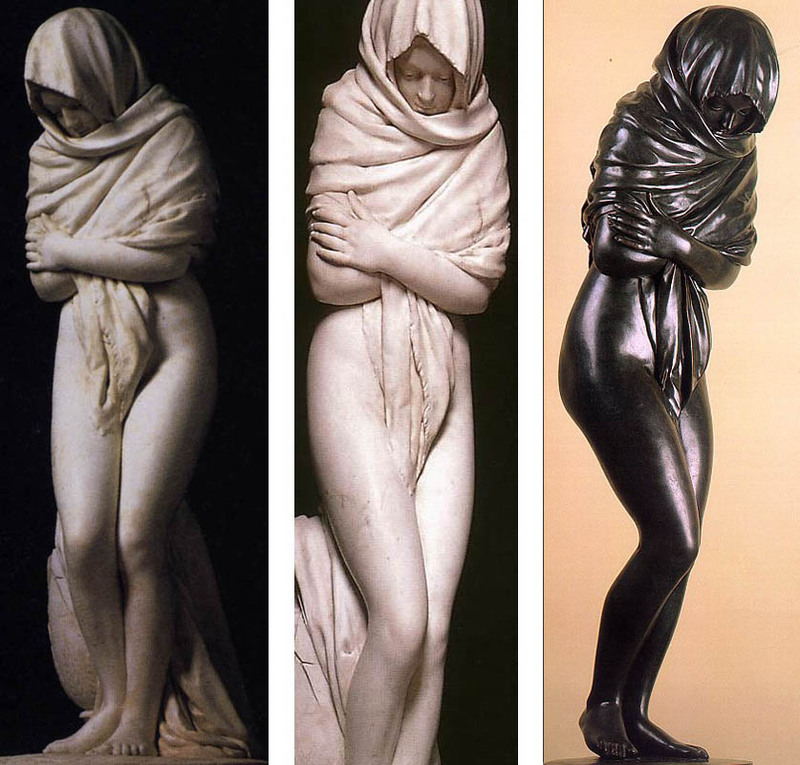 Jean-Antoine Houdon (1741-1828), unlike most of his contemporaries, built his career on portrait sculpture. He would have been glad to accept state commissions had they been available. However, he discovered quite soon his special gift for portraits, for which there was a growing demand. Portraiture proved the most viable field for Neoelassic sculpture. How else could modern artists rise above the quality of the Greek and Roman classics, which they were everywhere assured were the acme of sculptural achievement? Houdon's portraits still retain the acute sense of individual character introduced by Coysevox (see fig. 822). Indeed, they established entirely new standards of physical and psychological verisimilitude that reflect Enlightenment ideals. Houdon, more than any other artist of his time, knew how to give them visible form. His portraits have an apparent lack of style that is deceptive: his style consists of the uncanny ability to make all his sitters into Enlightenment personalities while remaining conscientiously faithful to their individual physiognomies. He even managed this on the rare occasions when he had to make portrait busts of figures long dead, or when he had to work from a death mask only. 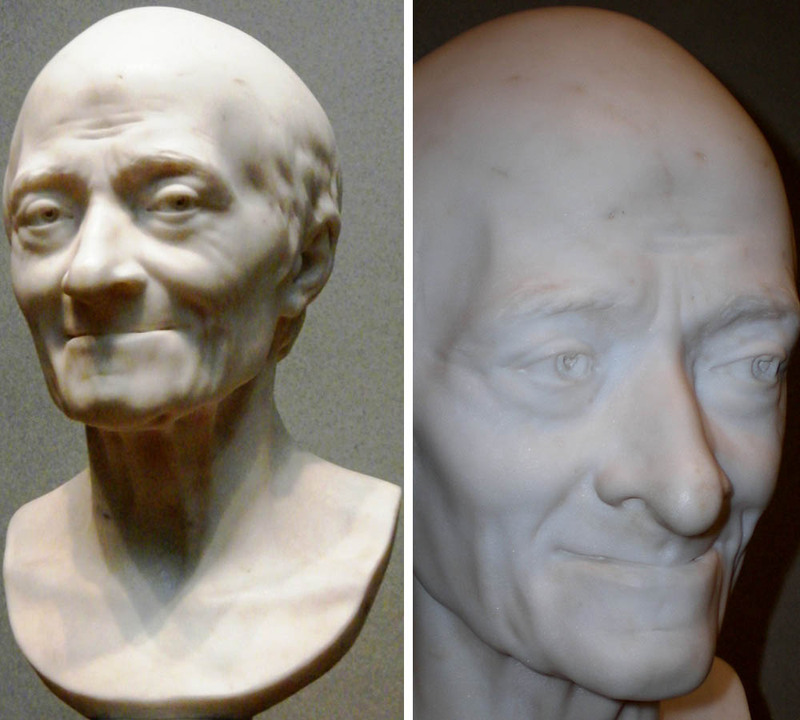 With Voltaire, he was more fortunate, modeling him from life a few weeks before the famous author's death in Max 1778, and then making a death mask as well. 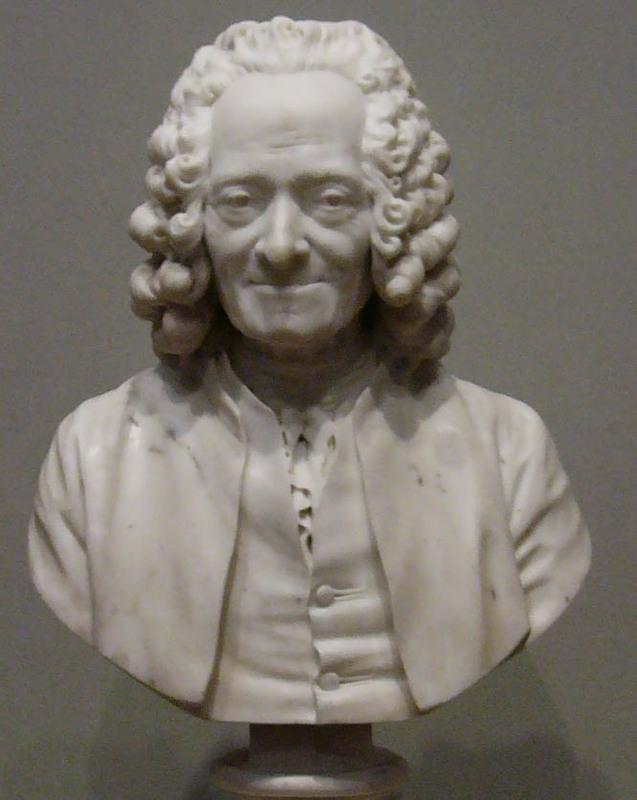 From these he created Voltaire Sealed (fig. 866), which was immediately acclaimed as towering above all others of its kind. The original plaster has not survived, but a terracotta cast from it, retouched by Houdon, offers a close approximation. 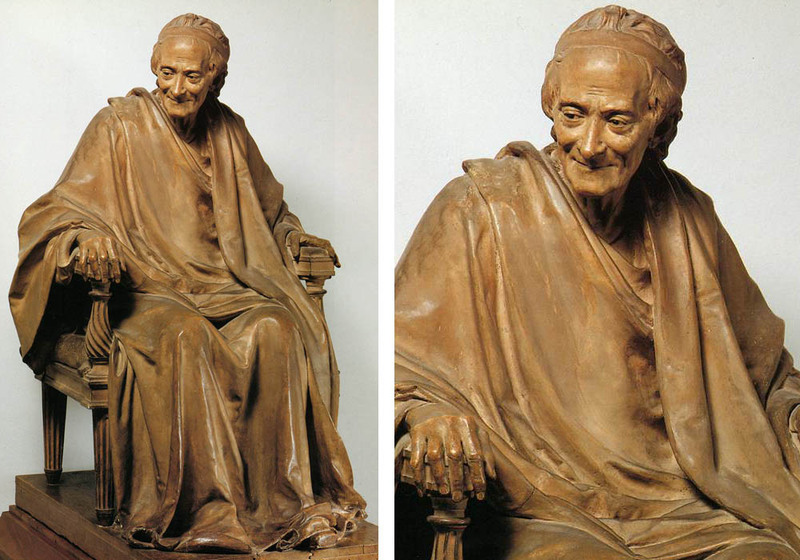 As contemporary critics quickly pointed out, the Voltaire Seated was a "heroicized" likeness, enveloping the frail old man in a Roman toga and even endowing him with some hair he no longer had so as to justify the classical headband. 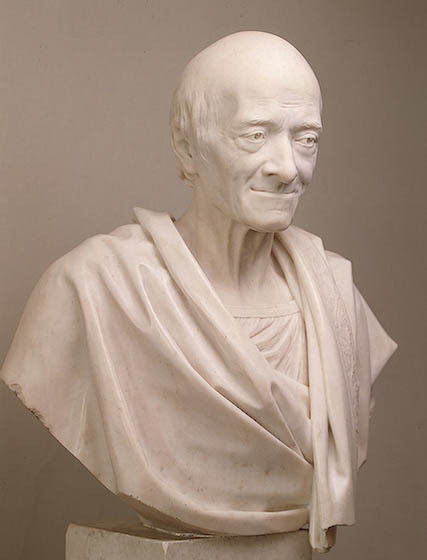 Yet the effect is not disturbing, for Voltaire wears the toga as casually as a dressing gown, and his facial expression and the turn of his head suggest the atmosphere of an intimate conversation. Thus Voltaire is not cast in the role of classical philosopher�he becomes the modern counterpart of one, a modern classic in his own right! In him, we recognize ourselves. 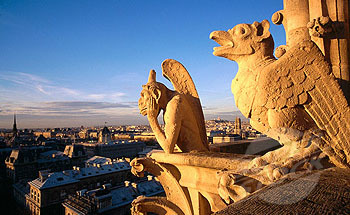 Voltaire is the image of modern man: unheroic, skeptical, with his own idiosyncratic mixture of rationality and emotion. That is surely why Voltaire strikes us as so "natural." We are, after all, the heirs of the Enlightenment, which coined this ideal type. Aside from his Voltaire Seated, the Virginia George Washington (fig. 867) is Houdon's finest effort. 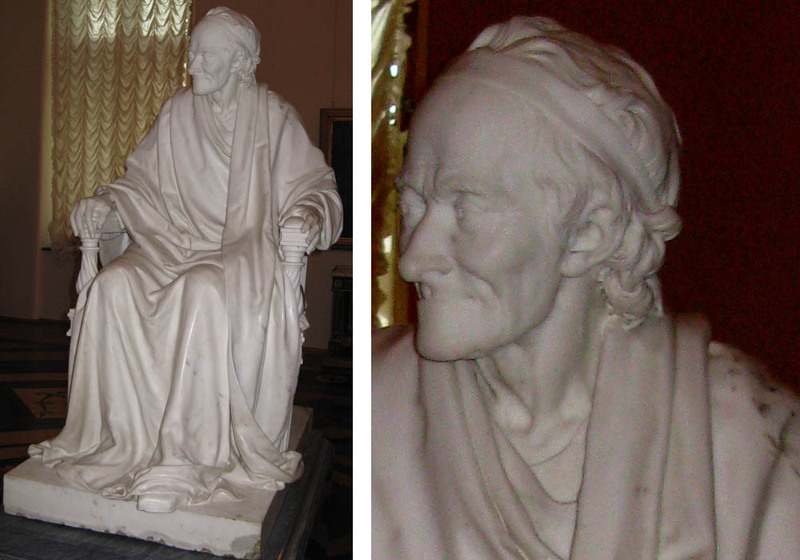 In 1778, the year he portrayed Voltaire, Houdon became a Freemason and modeled Benjamin Franklin. Replicas of the Franklin bust spread the artist's lame in the New World. American colonial sculpture hardly existed aside from weathervanes, tombstone carvings, and cigar-store Indians. Public monuments were few. and imported from England rather than produced at home. Thus the newborn republic had to look to France for a sculptor to immortalize its Founding Father. It could not be entrusted to an Englishman, for obvious reasons, and there was, it seems, no contact with British sculpture from 1776 until after the fall of. Napoleon. Thus when the Virginia legislature decided to commission a marble statue of George Washington, the natural choice was Houdon. Houdon insisted on coming over to model his sitter directly, and in October 1785, he spent two weeks at Mount Vernon as Washington's guest. The figure was finally erected in the rotunda of the State Capitol 11 years later. 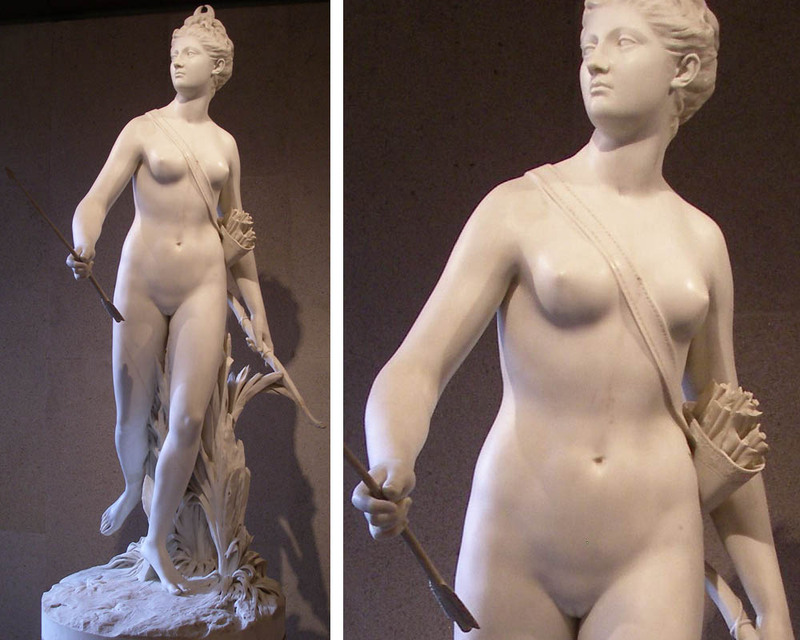 Houdon initially made two versions, one in classical and one in modern costume, the final form of the statue. Even the latter, though meticulously up-to-date in detail, has a classical pose, and we can feel the chill breath of the Apollo Belvedere (fig. 209). as it were, on the becalmed, smooth surfaces. By this time, Washington no longer held public office; he was simply a gentleman farmer. 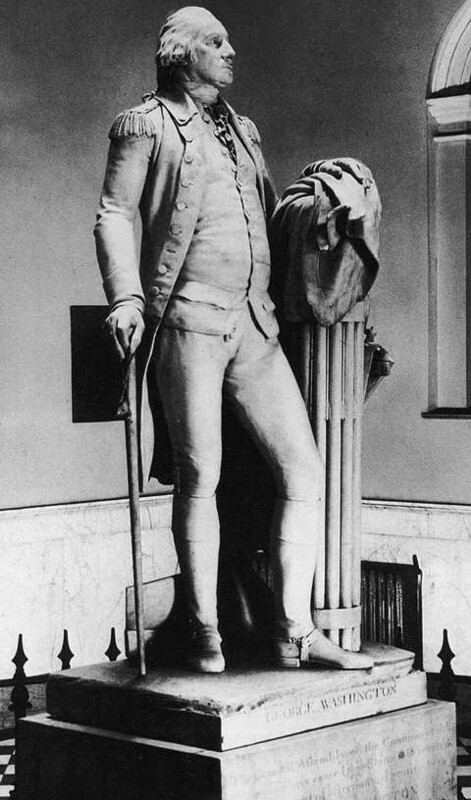 Houdon has given him a general's uniform, but the sword, no longer needed in peacetime, is suspended from a bundle of 13 rods (the fasces, representing the original states of the Union) and his right hand rests on a cane. Behind his feet is a plow, the symbol of peace. 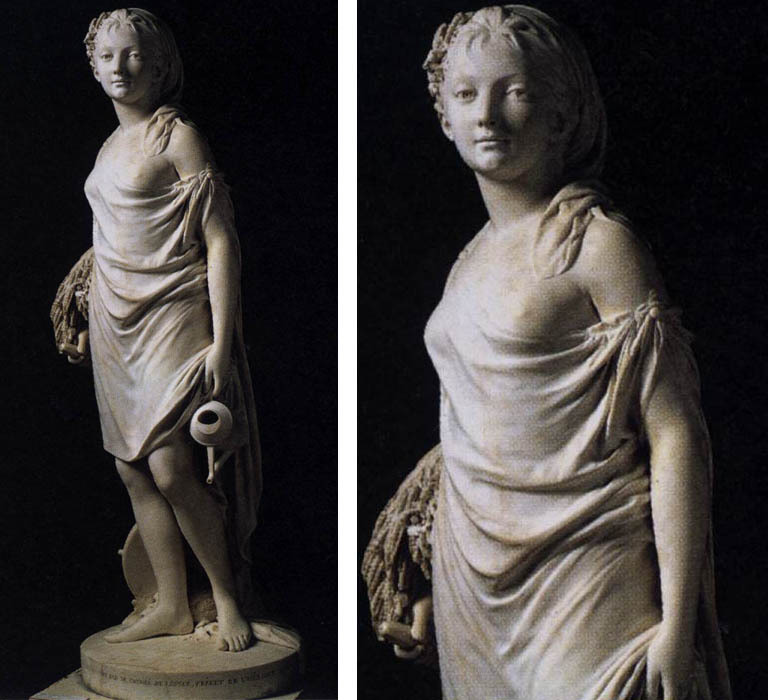 These attributes, with their classical allusions, blend easily with the contemporary dress, and the contrapposto stance of the figure is so well motivated that the beholder is hardly aware of its antique origin. Above all, Houdon has created a powerful impression of Washington's character along with a meticulous record of his physical appearance, in the framework of the personality type of the Enlightenment. Far more than any other portrait, Houdon's statue, and the busts associated with it, determined how the nation visualized the Father of His Country. Jean-Antoine Houdon, (born March 20, 1741, Versailles, France�died July 15, 1828, Paris), French sculptor whose religious and mythological works are definitive expressions of the 18th-century Rococo style of sculpture. Elements of classicism and naturalism are also evident in his work, and the vividness with which he expressed both physiognomy and character places him among history�s greatest portrait sculptors. Houdon began sculpting at age nine and underwent the long training prescribed by the Académie Royale. In 1761 he won the Prix de Rome, and while in Rome (1764�68) he established his reputation with a large marble statue of St. Bruno (1767) and an anatomical study of a flayed man, L�Écorché (1767), which brought him immediate fame and served later as the basis for replicas widely used for instruction. In 1770, two years after his return to Paris, he presented a reclining figure, Morpheus (marble version, 1777), as his reception piece for membership in the Académie Royale. He earned his livelihood, however, through portraiture; his sitters included Denis Diderot, Empress Catherine the Great of Russia, and Benjamin Franklin. 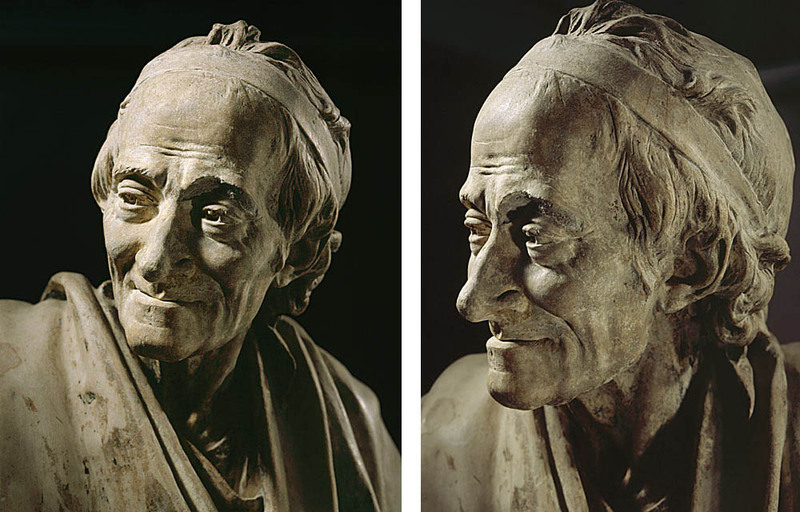 Houdon created four different busts of Voltaire in addition to the renowned seated figure at the Comédie-Française, for which the sculptor made first studies shortly before the death of the aged philosopher in 1778. 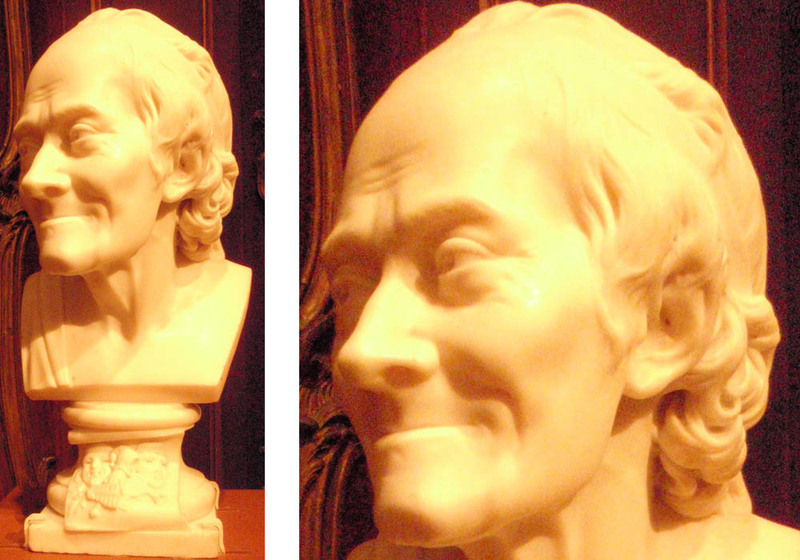 Five weeks later, on hearing of the death of Jean-Jacques Rousseau, Houdon hastened to the philosopher�s home at Ermenonville and took a cast of the dead man�s face, from which he developed the bronze bust that is now in the Louvre. In 1785 Houdon crossed the Atlantic to carry out a commission for a statue of George Washington. Several weeks spent at Washington�s home at Mount Vernon were sufficient for him to complete his studies, which he took back to France. 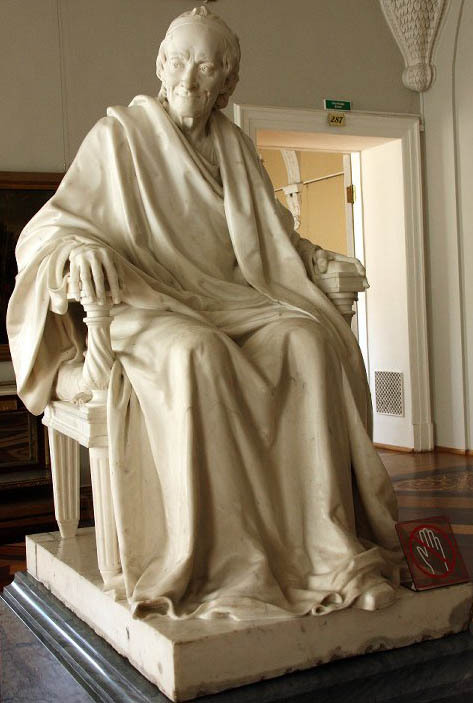 The marble statue, signed and dated 1788, was set up in the Virginia state capitol at Richmond in 1796. 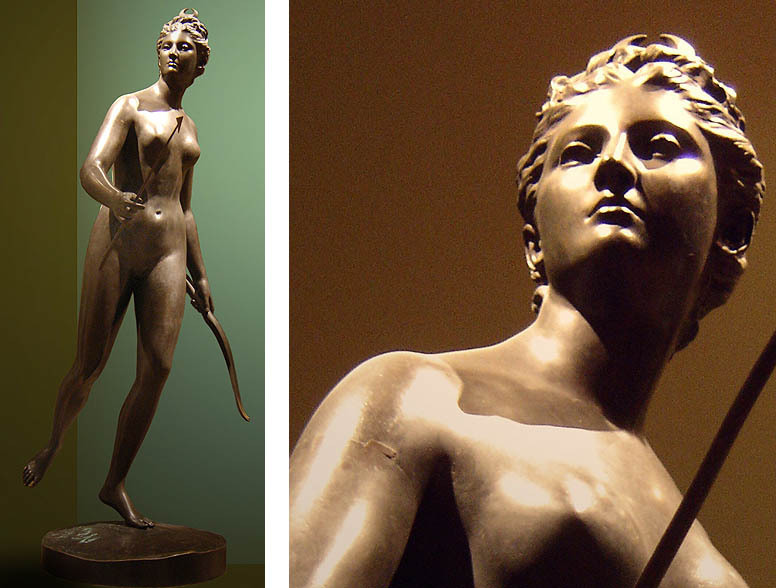 Houdon modeled his sculptures in clay, although subsequent versions might be of marble, bronze, or plaster. A skilled technician in all of these mediums, Houdon either took full charge of repetitions or limited himself to finishing touches upon his assistants� work. 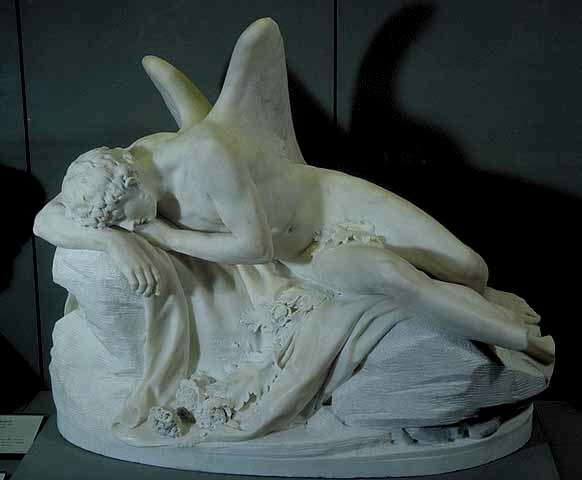 He preferred retaining the toolmarks in his sculptures rather than polishing them out, choosing to suggest a sense of freshness in execution that accorded with his concern for a characteristic pose and for the effect of a direct and vivid glance. 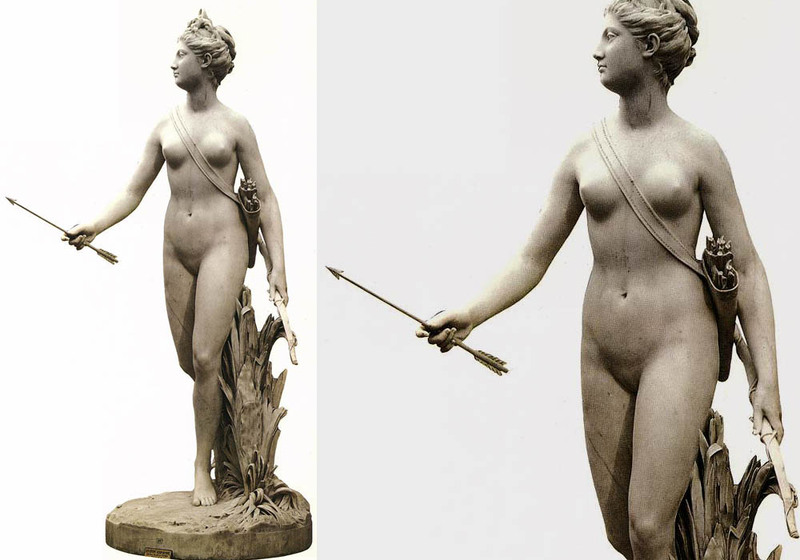 The most celebrated of Houdon�s mythological works is his supple, elegant statue of Diana, first shown in 1777, although not at the Salon�possibly to avoid questions of propriety because of the artist�s frank treatment of the life-size undraped figure. At the Salon of 1791 Houdon exhibited busts of the marquis de Lafayette, Benjamin Franklin, the count de Mirabeau, the banker Jacques Necker, and the astronomer J.-S. Bailly. Houdon�s prestige continued during the turbulence of the French Revolution and the Napoleonic era. After the downfall of the French Empire in 1815, however, he passed out of vogue for a time.